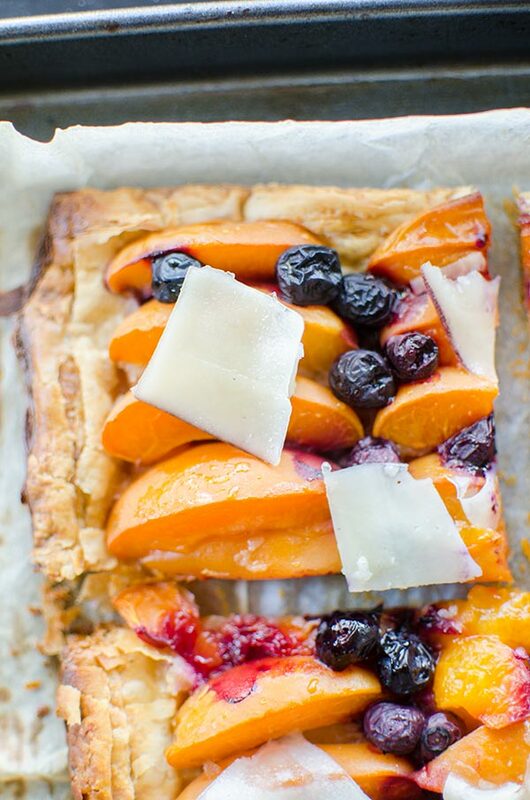 Make the perfect summer dessert with this simple puff pastry apricot blueberry tart topped with Tipsy cheese. I’m a firm believer in cooking fruit-forward desserts in the summer. Whether you’re baking with strawberries, peaches, apricots or blueberries, this is the time of year to make the most of the flavourful, sweet fruits. But here’s the thing, not only do I want to cook with them, I also want to elevate them and use them in a creative way. I’m always challenging myself to be more creative in the kitchen; it helps me build confidence and expand my skills. 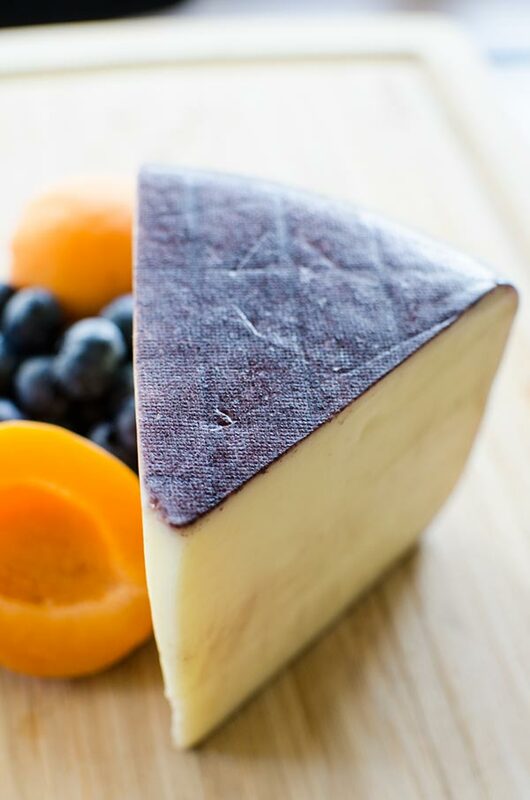 For this dessert recipe, I was inspired by the creativity of Canadian cheese with Dairy Farmers of Canada and the newest featured cheese of the month, Tipsy. This is an artisanal washed-rind cheese soaked in a Cabernet Merlot. These are the kinds of specialty cheeses you can find locally sourced all over Canada (this is from Gunn’s Hill Artisan Cheese in Oxford County, Ontario). 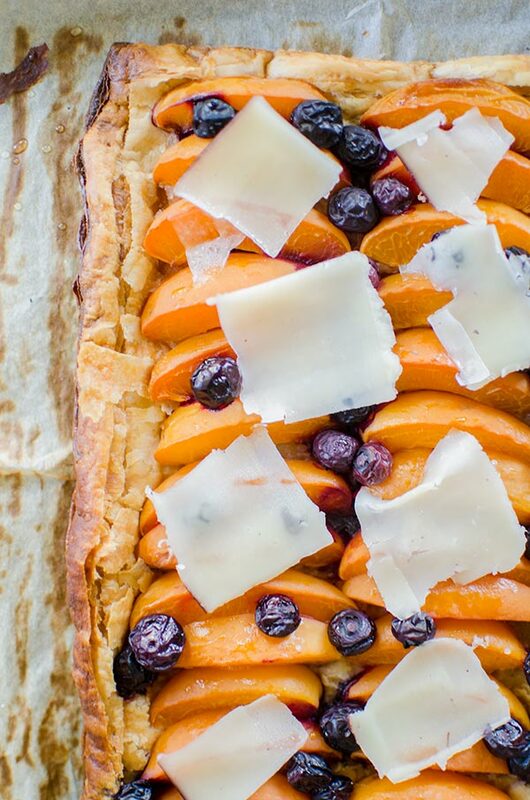 The sweet and creamy cheese with its edible, wine-soaked rind is the ultimate way to elevate this puff pastry apricot blueberry tart. I get a lot of people asking me how I come up with my ideas for recipes, and I always say from everywhere! We eat at least three meals a day, and if you’re not inspired by something you’re not eating the right things. Recently I’ve be reading the Chez Panisse cookbook, which is one of the most influential cookbooks for what is considered to be “California Cuisine”. The focus on the fresh, high-quality ingredients that California cuisine is known for was definitely an element of inspiration for this dish. You’ll notice the pared-down list of ingredients, this is because I wanted the blueberries, apricots and cheese to shine. I think highlighting the ingredients in their natural form is pretty magical. I like to let the tart cool before topping with cheese, however because Tipsy is a Swiss-style cheese that is ideal for melting, adding a thin layer of cheese all over the top of the tart while it’s still hot and popping it back into the oven for another minute takes this delicious dish to a completely different level. Preheat oven to 400F. Score a 1/2-inch border around the edges of pastry, prick all over with a fork. Bake for 10 minutes, pressing down with the back of a spoon if the pastry puffs up. Arrange apricot slices on pastry, leaving the border around the edges. Sprinkle with blueberries, cook in the oven for another 30 minutes. Remove from oven. In a small bowl, whisk honey with water. Brush over fruit, sprinkle with sugar and top with slices of cheese. Slice into six even pieces. Disclosure: This post was sponsored by Dairy Farmers of Canada – as always, all opinions are my own. 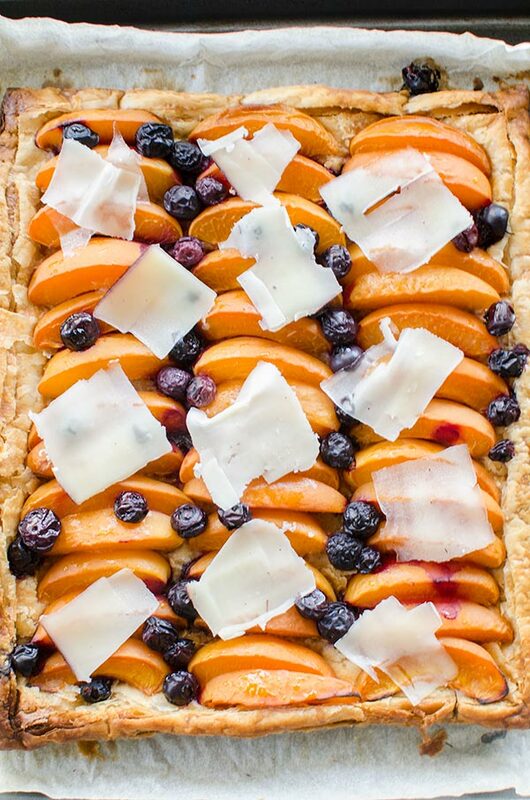 Thank you for supporting my sponsors and allowing me to continue creating recipes like this puff pastry apricot blueberry tart recipe.